Mongolia shed its one-party system in 1990. Now both its economy and its traditional culture are booming. In Mongolia today there are reminders everywhere of the nation’s nomadic past. 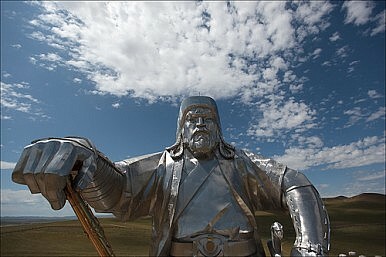 Upon arriving at Chinggis Khaan International Airport – the nation’s only international transit point – visitors are greeted by a statue of the fearless wandering conqueror of yore. Traditional portable homes – gers – dot the outskirts of the capital city of Ulan Bator and fill the landlocked country’s vast steppe, ready to be folded up and carried to better pastures at a moment’s notice. And if you head out beyond the yurts into the hinterlands, three million wild Mongol horses can be seen running free – that’s more than the nation’s human population. The one drawback, she says, is the lack of privacy. “Everyone sleeps in the same space. But the functionality is what matters to people who are often herders and need to move frequently. You can take one down and move within a day. Their lives depend on their animals so they need to move wherever the best grass is. Traditionally, herders move around five to six times per year.” The most common livestock includes horses, cows, sheep, goats, and camels, which are native to the Gobi Desert. A video of nomads moving their ger can be seen here. The clearly visible divide between Mongolia’s haves and have-nots has arisen only since 1990, when the nation ushered in democracy and bade farewell to 200 years of dominion under China followed by 70 years as a Soviet satellite. Under Soviet rule, economic disparities were not the only aspect of Mongolian life hidden from view. During the Soviet period, Buddhist monks were killed (in the 1930s), temples burned, and mention of the nation’s most iconic figure – Khan himself – was banned and all but snuffed out. For good measure, one of the country’s richest men also built a 131-foot-tall statue of the great Khan on the outskirts of Ulan Bator. It may seem hard to believe that a nation could be forced into a state of amnesia about its most prominent historical figure – a man who practically defines the nation’s identity – but there is one factor that should be considered. While Genghis may not have left behind a Forbidden City or Great Pyramid, there is one constant of Mongolian life that has remained unchanged through successive foreign occupations and continues today: horsemanship. Tomorrow we look at the Mongols’ special relationship to the animal that is so integral to both their past and present. Editor’s note: The text has been updated from the original to reflect the fact that the portable homes referred to as yurts in much of Central Asia are known as gers in Mongolia. Amid sweeping changes taking place in Mongolia, one thing remains constant: the importance of horses. Trash to Treasure: A Mongolian Man Turns a Landfill Into a Children’s ParkA Conversation With Mongolia's Foreign Minister Tsend Munkh-OrgilPollution Like Snow: A Mongolian WinterThe Herding Life in MongoliaIs Ulaanbaatar Running Out of Water?